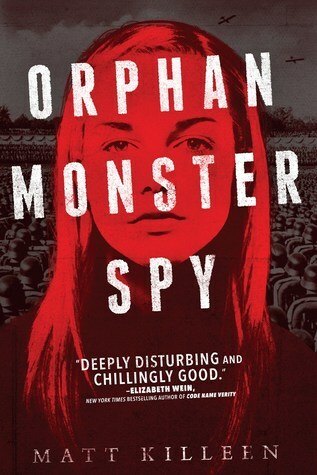 Sarah is fifteen, blue-eyed, blonde—and Jewish—living in 1939 Nazi Germany in “Orphan Monster Spy” (Viking 2018) by Matt Killeen. The story opens with Sarah’s mother being shot at a roadside checkpoint. Sarah, now an orphan with no identity papers, runs. Her former gymnastic training helps her scale walls and skirt roofs. She meets a man with an unidentifiable accent. In her desperation, she lets him rescue her. Just as Sarah, aided by her rescuer, is about to find freedom on an outbound ship, she returns the favor by getting off the ship and rescuing her rescuer. Sarah knows her rescuer, first, as Captain Floyd, a British spy. Sarah learns about her mysterious savior through his library. She assesses him “A liar and a trickster.” “Correct,” he says. Can we trust him? Soon Captain Floyd becomes Herr Haller. With Sarah’s Aryan looks she can pass for Hitler Youth. Haller enrolls her, as Ursula, his niece, at an elite Nazi girls boarding school. The daughter of a Nazi scientist who is purported to be building a bomb on his nearby estate—a bomb capable of destroying European cities—is also enrolled. Girls can be mean. Nazi schoolgirls have had special training for the task. Sarah has issues with the monster role. She instinctively wants to protect the weak. At the same time she competes with the strong, in an effort to win their respect. She must win over the “Ice Queen,” the leader, to get to her real subject—daughter of the bomb builder. Sarah feels she must win a brutal cross-country race, which spans a fast running river and miles of woods. She uses the power of memory of Kristallnacht—the injustice of what was done to Jews—to fuel her ability to cross over the canopy of trees, which spans the river, rather than the regular route over the bridge. Is this cheating? In a world so brutal a little cheating is easily forgiven. If she can defuse the process of bomb-making by reporting secrets to Herr Haller, the free world might be saved—she hopes. Big stakes. And it’s all told in a believable manner. There are those who think this is an adult book, which would be enjoyed by young adults, but it’s published and marketed as young adult. The flaws of the protagonist make us believe in the authenticity of this high-tension high-stakes story.